After an exhausting day of work, it’s nice to sit back and appreciate the work that was accomplished. 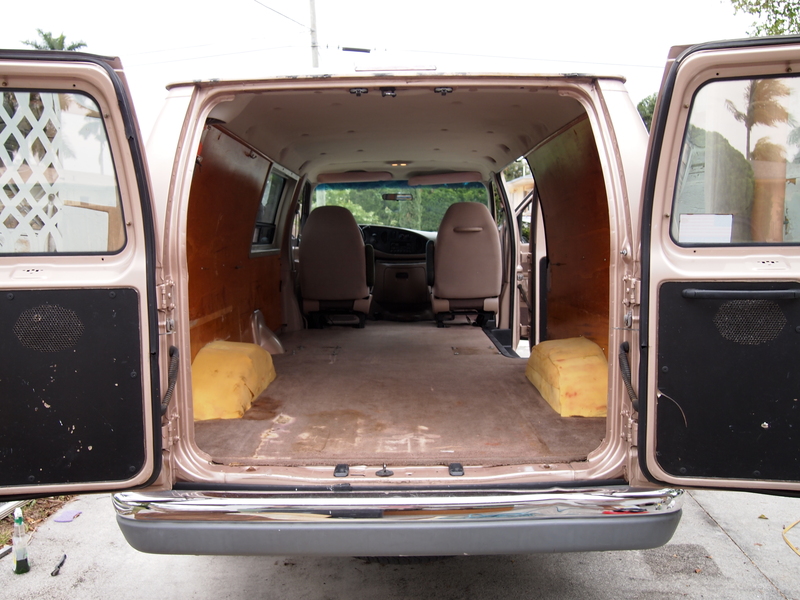 The steps are gone, the tires are inflated, the cabinets/storage removed, the doors and windows scrubbed clean, the two back seats removed, the driver, passenger seat and carpet vacuumed, the walls wiped down, the rust taken care of (mostly), and partial installation of the bed has been completed! The van looks completely different. 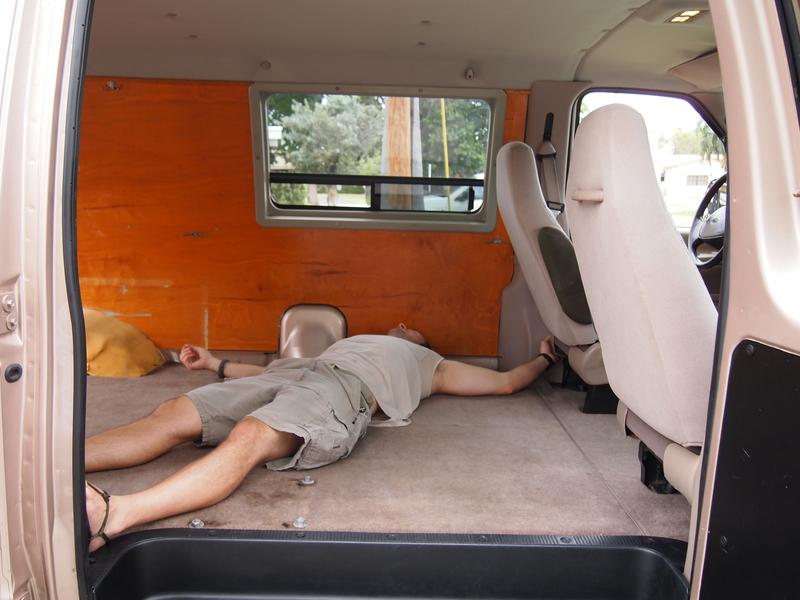 Besides cleaning up the van the main part of the bed is done. It is somewhat of a floating bed. A piece of 2×4 was measured out for a full size bed (54 inches wide). 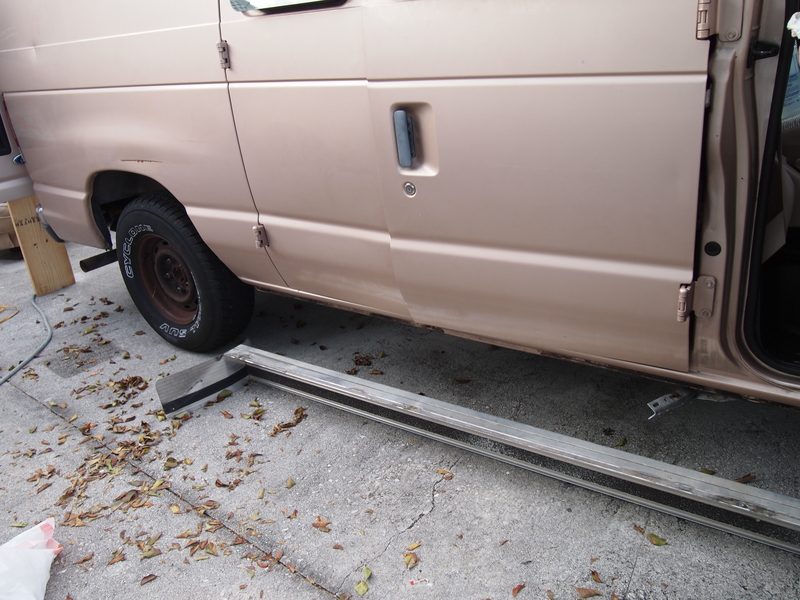 Although a normal full size bed is 75 long by 54 wide, our van is only 71 inches wide so the mattress will most likely be a bit squished. So anyway, once the wood was screwed in, four pieces of metal tubing were evenly distributed. The little square holes where then cut out so the tubing could fit inside. A piece of plywood will then be placed of these bars, along with some rubber mats and then the mattress will sit on top of the mats. The rubber mats will hold the bed in place a bit better so it doesn’t slide around and it will keep splinters from getting into the mattress. Cabinets and storage will soon be going up as well, along with a counter top with a functional sink. We will be setting up a removable stove and have opted out of a microwave. Doesn’t food taste better over a fire anyways?